I’ve mentioned the Captive Prince trilogy many times on my Instagram account. I figured it’s high time I make an official recommendation by posting it on my blog. From standalones to series, I have read many books in my time. I have only four series that have left a major imprint on me and the Captive Prince trilogy is one of them. I have always been a fan of darker types of stories, and a bigger fan of romance. This trilogy has both. Do not read this trilogy expecting fluffy and sweet romance – you’ll find little of that in this series, particularly in the first book. There are many scenes that could make a person uncomfortable, but that’s the beauty of this story. Through the abuse, betrayal, lying, and scheming, Damen and Laurent manage to form a relationship. Damen is a character with a heart of gold. He’s a person you want on, and by, your side. He’s full of patience, understanding, and loyalty. Laurent is a character that I disliked at first, but that’s because he’s so conniving, with many layers, that you don’t see his true self until almost the third book. From the first book all the way to the end of the last, there is so much scheming among the characters that I wanted to devour the books to get at the root of it all. It’s a trilogy that kept me on my toes wondering who was lying, who was going to betray whom next, and most importantly: when would Damen and Laurent be together?! I urge everyone who loves a darker dose of romance to read this trilogy. 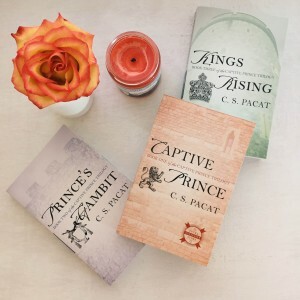 The books are Captive Prince, Prince’s Gambit, and Kings Rising by C.S. Pacat. 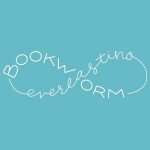 Obsessive book lover and compulsive book merchandise buyer.